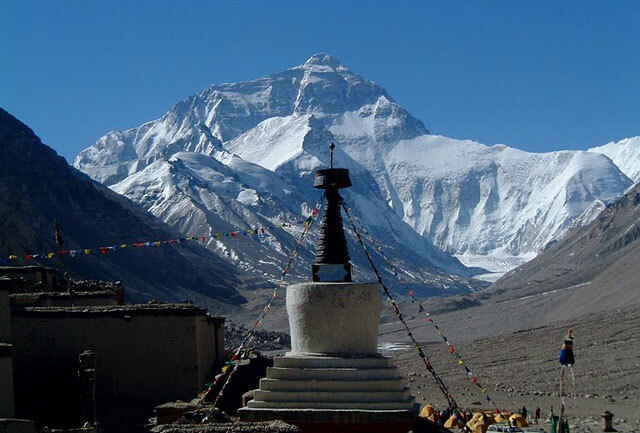 Overland Tibet tour via Everest base camp – Lhasa to Kathmandu overland tour via Everest base camp passes through cultural centers of Tibet like Lhasa, Gyantse and Shigatse, drives past high passes and beautiful turquoise lakes and finally takes you to the northern base camp of mt Everest before reaching Kathmandu. 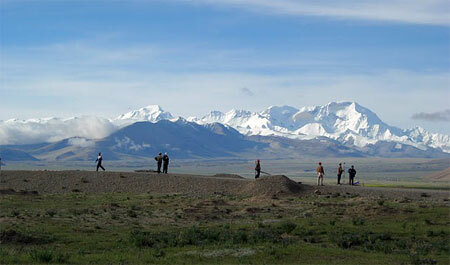 This is the most popular of all our tours in Tibet and covers all the best that the land has to offer. The tour starts with a spectacular flight across the Himalayas from Kathmandu to Lhasa .In Lhasa we explore the heritage sites, important monasteries and old traditional quarter of the city .Some of these include the Potala palace , Jokhang temple , traditional Bharkhor market and Drepung and Sera monasteries. We leave Lhasa in a 4WD jeep and en route our overland Tibet tour pass through ancient Buddhist monasteries of Tashilumpo at Shigatse, the Kumbum Stupa at Gyantse, and drive past the beautiful turquoise lakes . Enjoying superb mountain scenery, we reach the Rongbuk monastery and the base camp of Mt Everest itself. The view is simply breathtaking . Finally we cross the Nepal Tibet border and drive to Kathmandu along the lush forest and farm terraces, in contrast to the arid and dry Tibet. Below you will find two different itineraries , the first one driving Lhasa to Kathmandu and the second one driving from Kathmandu to Lhasa , the opposite way. Our guide will welcome you at Kathmandu airport, takes you to hotel and helps you with the check in formalities. Free time to explore interesting streets of Kathmandu on your own or rest . Day 02: Chinese visa processing , guided tour of Kathmandu. While we collect your passport and apply for Chinese visa at the Chinese embassy in Kathmandu, you will go for sightseeing tour. We cover the Kathmandu Durbar square, Swoyambhunath stupa and Bouddhanath stupa. Evening briefing about your Tibet tour . If you are not entering Tibet from Kathmandu but from mainland China/ Hong Kong/ Chengdu etc, your tour starts from here . Enjoy the fantastic trans Himalayas flight that flies past mt Everest to Lhasa . Our Tibetan guide receives you at Lhasa’s Gongkar airport and takes you to Lhasa city through and scenic drive of 1.5 hr. Explore the nearby streets on your own or rest and acclimatize . Day 04: Guided tour of Potala palace, Jokhang temple and Bharkhor street . The tour today covers the Potala palace of the Dalai Lamas, the holiest of the Tibetan temple- Jokhang and visit to the traditional Bharkhor street . Day 05: Guided tour of Drepung and Sera monastery . We visit the two biggest Gelugpa monasteries of Tibet where there used to be up to 10000 monks living in the bygone days . These monasteries also serve as University to learn Buddhism for the monks and the spiritual debate among monks is the thing not to miss here. We drive on a 4WD jeep through fabulous scenery . We drive past Khamba La, at 4794 meter, with a brief halt to savor majestic views of Yamdrok-tso Lake and Nazin Kang Sa, standing at 7252 m. Further westwards, we come across another pass, Karo La at 5045m where you can see huge glaciers tumbling down. After driving 261 km, beautifully landscaped Tibetan villages become visible as you enter the town of Gyantse. Guided tour of Kumbum stupa and Pelkhor temple in Gyantse then drive to Shigatse . 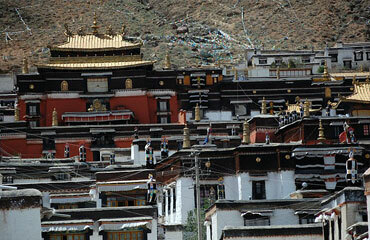 In Shigatse we visit the famous Tashilhunpo monastery, the seat of the panchen Lamas. It is yet another scenic day driving past small town of Lhatse and cross Gyamtso La pass at 5220m. As the route opens into plains, many monasteries and camps of nomadic herders become visible en route to Shegar. We drive southward and cross Pang La pass at 5150m. Enjoying superbly beautiful mountain scenery, we reach to Rongbuk at 5000m . On a clear day, one can see a long range of the Himalaya including peaks over 8000, Makalu, Lhotse, Everest, Gyachung Kang and Cho Oyu. Rest and explore the area . Reaching to the very base of mt Everest at 5150 m would be the highlight of the whole trip – and that is today! The scenery is simply breathtaking . The mountains look even better during sunrise and sunset. We drive back Tingri ( on the main highway from where we deviated to the base camp the previous day) for our overnight stay. You will drive past Tingri crossing Lalung La pass at 5124m and Shug La pass at 5200m. Spectacular views of the surrounding peaks of Shishapangma, Cho Oyu, Menlungtse and Gauri Shankar will greet you while descending from arid Tibetan Plateau to the green , small town of Zhangmu near Nepal Tibet boarder. 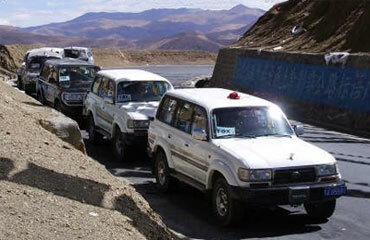 Complete the immigration formalities, leave your vehicle form Lhasa at the boarder. Our guide from Kathmandu will receive you at the boarder, get Nepal visa ( if you do not have one ) and drive along a superbly scenic highway to Kathmandu. Rest . Note : If you have limited time this tour can be done even on 12 days . Price: In order for us to quote you the price , write us with number of persons in your group and the category of hotels you would like to stay in . China visa cost : USD 114 for Europeans and USD 198 for US passport holders . Flight cost : Kathmandu – Lhasa one way flight cost is USD 400 at present . Air China increases/ decreases the airfare few times a year . For the existing fare, please confirm with us while booking the trip. Three star hotels in Kathmandu on bed and breakfast plan, twin sharing rooms . Arrival transfer from Lhasa airport to Lhasa city. Three star standard hotel in Lhasa/ Shigatse / Gyantse and best available hotels along the Lhasa Kathmandu highway . Rooms on twin sharing, bed and breakfast plan . Please note that Shegar, Rongbuk and Zangmu have only basic hotels and no luxury . This tour is same as above but starts from Kathmandu and ends at Lhasa . This is ideal for those who do not need to return to Kathmandu from Lhasa or in the case we do not get flight ticket for Kathmandu to Lhasa but get one for Lhasa to Kathmandu ( flights for Lhasa are often packed ) . Doing this tour the opposite way is also equally interesting and popular . Day 02 : China visa application / collection . Guided tour of Kathmandu including Kathmandu Durbar square, Swoyambhunath and Bouddhanath stupa. Day 04 : Zangmu to Tingri , 4350 m , watch spectacular Himalayas en route . Day 12 Fly to onward destination from Lhasa .